The South Asian Modern & Contemporary art market picks up momentum. 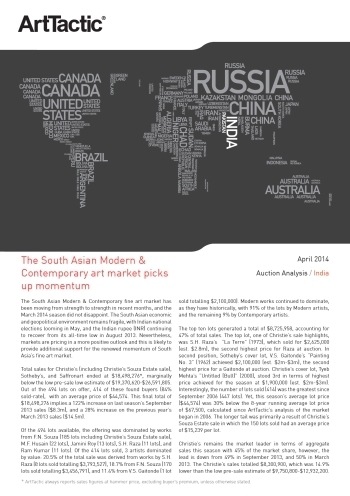 The South Asian Modern & Contemporary fine art market has been moving from strength to strength in recent months, and the March 2014 season did not disappoint. The South Asian economic and geopolitical environment remains fragile, with Indian national elections looming in May, and the Indian rupee (INR) continuing to recover from its all-time low in August 2013. Nevertheless, markets are pricing in a more positive outlook and this is likely to provide additional support for the renewed momentum of South Asia’s fine art market. Total sales for Christie’s (including Christie’s Souza Estate sale), Sotheby’s, and Saffronart ended at $18,498,276*, marginally below the low pre-sale estimate of $19,370,620-$26,591,805. Out of the 494 lots on offer, 414 of these found buyers (84% sold-rate), with an average price of $44,574. This final total of $18,498,276 implies a 122% increase on last season’s September 2013 sales ($8.3m), and a 28% increase on the previous year’s March 2013 sales ($14.5m). Buy subscription for full access to the report, which includes comparative analysis of Sotheby’s, Christie’s and Saffronart.